This adult female Entyla turrita was observed along French Creek, Bradshaw Mountains, Yavapai Co., Arizona. May 2009. It was feeding on Canyon Ragweed (Ambrosia ambrosioides). Identification was provided by Andrew Hamilton, Canadian National Collection of Insects, Arachnids and Nematodes. Canyon Ragweed (Ambrosia ambrosioides) has thick, sticky, broad leaves. The foliage is also rife with aromatic compounds that for most herbivores are a deterent to feed. 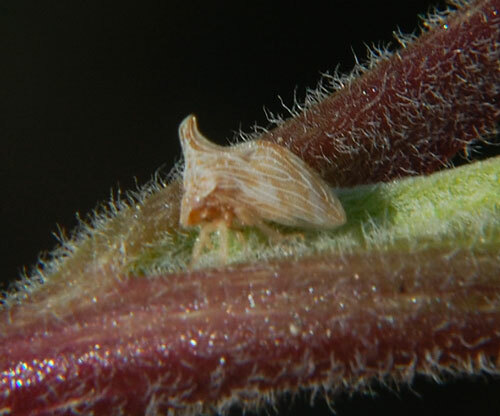 Treehoppers bypass many plant defensive chemicals by means of inserting their long narrow mouthparts past the offending materials. These treehoppers live primarily on the undersides of the leaves or on the stems below the leaves, protected from the intense sunshine. When it gets really hot the leaves curl further protecting the undersides - and the bugs taking refuge there. 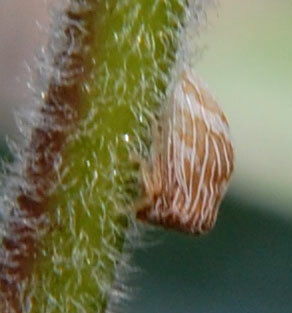 Most treehoppers have some form of spine or thorn on the pronotum. In Entyla turrita, the female shown at left has a larger thorn than the male's. They are small, less than 5 mm long; they are mostly encountered from late spring through the summer rainy season. Males have just a small horn of merely a bump.